This set covers Chicago are in the 1950’s – 1960’s. The many railroads and locations give a good overview of the Chicago area. The combination of Green Frog and Emery Gulash is usually, a good match of filming, and production. Does it work on this release? The era that is portrayed had a desired element for railfans, then and now. Many roads ran many more trains! A balanced mixture of freight and passenger trains. There is such a myriad of trains, it’s difficult to condense it down in a review. We’ll get it done. The railroads include: ATSF, CB&Q, NP, GN, IC, RI, CNW, MILW, GM&O, GT, NW, C&O, EL. The power is as varied as the roads themselves. An abundance of 1st generation Electromotive, with some new 2nd generation on mainline freight trains. Fast freights behind GP20 and GP30 matched sets are a sight! Alcos are present, in a small percentage. Watch for GE-U25B’s. Some steam is also viewed. Electrified Illinois Central and a North Shore segment. Nice to see, all the original paint schemes, along with some updated ones. I enjoyed the Grand Trunk, original and new in particular. Burlington Route gets the largest share of time. Less photographed lines such as Monon, Chicago & Eastern Illinois, EJ&E are also shown. There is a CB&Q steam fan trip near the beginning, and another shows up as a distraction later on. As I have said before; these bog down the story, in this case, the daily action of Chicago. This footage should be at the end, as a bonus. The images are fine, but I want those early diesels and classic boxcars. The fast paced action of the show, gets derailed as we chase this thing halfway across the state. A GTW special and more. Specials…..
Quality is first-rate. The sound is excellent and is the live sound type. Dolby Digital Stereo. The picture is crisp. Colors are bright and it all…looks right. That 16mm film has never looked better, then in the DVD version. I had the vhs tapes for years and upgraded to this dvd version. Narration is descriptive, but sits back enough to let the sounds come through. This is one of my longtime Green Frog/ Gulash favourites. I have to bring the ‘specials’ up as a reviewer. The rest of the program is perfect. There is such a wealth of great trainwatching in this set. Highly recommended for veteran and new railfans. An outstanding overview of the Chicago mecca, at its peak! This entry was posted in ATVR Reviews, Green Frog Prod. 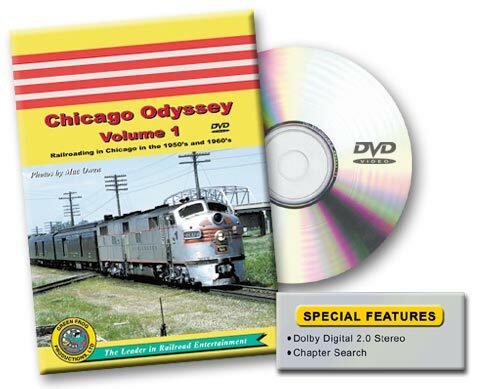 and tagged American Train Video Reviews, Burlington Route, C&O, Chicago railroad, Emery Gulash, Great Northern, Railroad, Santa Fe, Train DVD by William J. Hudson. Bookmark the permalink.